The American Association of Physicists in Medicine (AAPM) formed a Task Group under the Unconventional Brachytherapy Working Group of the Brachytherapy Subcommittee and the Radiation Safety Subcommittee of the Therapy Physics Committee (TPC). This Task Group, TG-152, was formed on 22 February 2007, and had its report approved by TPC on April 27, 2007. 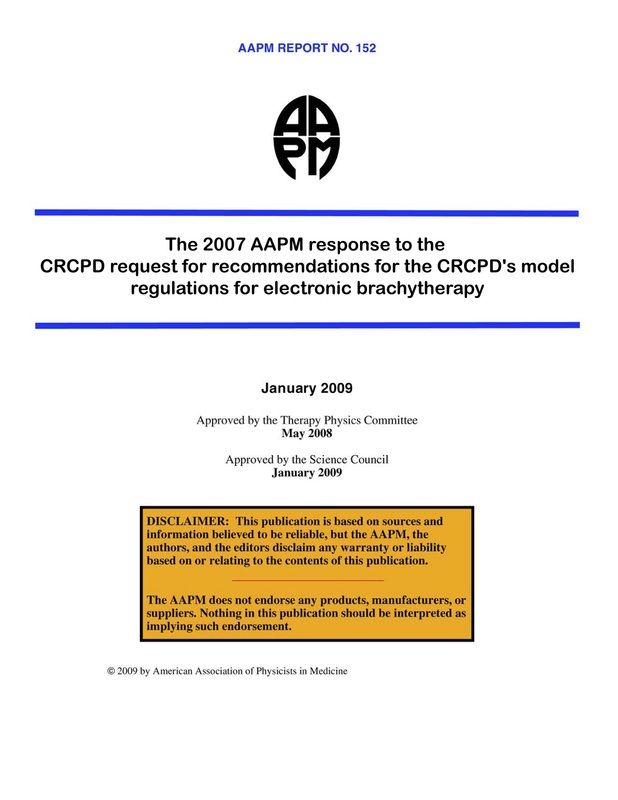 The Science Council approved this preface and placing this report on the AAPM web site on 26 January 2009. At the formation of this Task Group, electronic brachytherapy beyond an intraoperative modality was an emerging technology for clinical practice and several states were proposing regulations. The charge of this task group was to propose a set of model regulations for consideration of the Council on Radiation Control Program Directors (CRCPD), which was to discuss possible model regulations at its May 2007 meeting. This charge was executed. The AAPM suggestions are hereby made electronically available to the community.